. : Optics & Photonics Focus :: Thermal Images at the Nanoscale :. There is an invisible world illuminated by polarized light. A world that has been disclosed to us only by the technological advances of the last decades. Surprisingly, various Australian shrimps can see it. What happens when we put an electric insulator, such as iron oxide, under pressure and temperature conditions as extreme as those of the Earth’s interior? Thermal nanoimage. By illuminating with a laser a surface where gold nanorods are unevenly placed, sharp temperature gradients can be created on microscopic scales. Here such gradients are measured on a 30x30 microns area. The temperature varies between 24º(black) and 31º (yellow). Inset: microscope image of the same area where the nanorod density can be seen. Sometimes a slight change in temperature can make the difference between life and death. That is why our body is equipped with extremely sensitive temperature receptors — think of babies crying when the water for their bath is too hot or too cold. Temperature is also critical also for microscopic systems tough — a raise of a few degrees, for example, can kill a cell. However, how can we measure temperature in the nanoworld? Using a nanothermometer, of course! A new thermometric technique, developed by Romain Quidant and colleagues at ICFO (Barcelona, Spain), throughwithin a research sponsored by Cellex Foundation by Romain Quidant and colleagues at ICFO (Barcelona, Spain), allows one to measure the temperature with 300 nm spatial resolution and an accuracy of 0.1°C over various tens of degrees. Nowadays science and technology are craving accurate methods to measure the temperature at the nanoscale. In the transition from microelectronics to nanoelectronics, one of the limiting factors is the temperature increase due to the higher density of transistors on a chip. A direct glimpse at where and when the temperature increases will contribute to the design optimization. In medicine, an intensely studied application being investigated is photothermal therapy: gold nanoparticles might be injected in a patient, placed where the local heating is needed and then heated by infrared light. This is one of the most promising new techniques in modern medicine with applications expected in cancer therapy or gene/drug delivery. However, heating a portion of a patient requires caution – we would not want to set them on fire putting them to the torch! A very precise temperature monitoring technique is mandatory for safe and successful applications. Such an importance has heightened efforts to develop a thermal-imaging technique with both accurate temperature resolution and high spatial resolution. Scanning thermal microscopy, for example, uses a modified atomic force microscope to map temperatures with 50 nm resolution; despite its high-resolution, however, such a technique still needs to touch the sample with a tip to measure its temperature. Imaging techniques that do not require any direct contact with the sample have been more recently developed based on optical methods, such as Raman spectroscopy, fluorescence intensity or fluorescence time correlation. However, none of these techniques has brought together the advantages of reliability, fast readout rate and high-resolution, making them prohibitive for temperature imaging in nanotechnology. 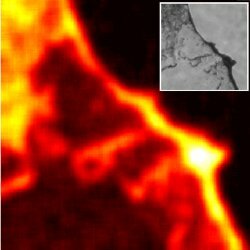 The new optical technique developed at ICFO overcomes such limitations, being able to deliver real-time, high-reliable and detailed images. The core of the new approach is a well-established technique known as fluorescence polarization anisotropy (FPA). A fluorescent molecule absorbs light at a certain wavelength, e.g. — for example green light , — and, after a short time delay, re-emits the light at a slightly longer wavelength, e.g. — for example red. If the absorbed light is linearly polarized, also the re-emitted light will be linearly polarized in the same direction — if the molecule has not changed its orientation during the short time between absorption and re-emission. However, since these molecules are immersed in a liquid they keep on changing their orientation due to thermal fluctuations called Brownian motion — the random walk that shakes every microscopic object immersed in a fluid — and consequently the re-emitted light polarization is slightly different from the incident absorbed light one. The FPA is based on the fact that the higher the temperature, the faster the molecule and, the more depolarized the light. Therefore, it is possible to measure the temperature using the light depolarization. "Our technique solves the problems encountered by the previous techniques," Guillaume Baffou, who is in charge of the project, explains. "First of all the FPA is an absolute measurement of the temperature, differently from the fluorescence intensity technique. This already makes things much easier and faster, paving the way towards temperature movies. Secondly, unlike in Raman spectroscopy, ﬂuorescence signal intensities can be very high, which allows for fast data acquisition. Finally, the resolution can be as high as what is provided by a confocal microscope [a few hundreds nanometers]." Prospected future applications of such a technique are exciting. "Our main objective for applying this technique," explains Quidant, "lies in the context of biomedical applications. We have already achieved good progresses on extending our method to the temperature mapping in living cells functionalized with plasmonic nanoparticles." However, the possible applications of such technique are not restricted to biological and medical applications. "What I really believe," envisages Baffou, "is that this technique is going to trigger the development of new research branches in nanotechnology, like for instance thermo-plasmonics or nanothermofluidics. These two fields were just waiting for a tool to be born." GV is currently working as a postdoctoral researcher at the Max Planck Institute in Stuttgart (Germany). G. Baffou, M. P. Kreuzer, F. Kulzer, and R. Quidant, Temperature mapping near plasmonic nanostructures using fluorescence polarization anisotropy, Optics Express (2009) 17, 3291-3298 (link).